Earlier this season, a good friend of ours stumbled across a new food box program in our city: Fresh City Farms. 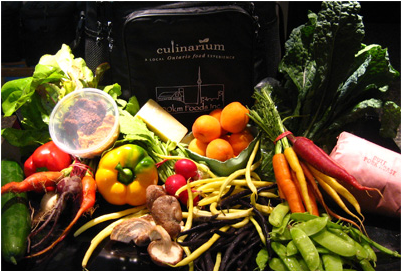 After our time with Culinarium, which sadly closed its doors earlier this year, we were open to participating in another food share program. What is attractive about Fresh City Farms that sets it apart from other programs was its door-to-door delivery, organic promise, and finally, the hyper-local focus of their food philosophy – as local as possible, in fact. Perhaps organic and door-to-door is obvious, but why local? 1. It’s healthier. The produce we eat is in essence converted energy from the sun. I know this is an oversimplification of a far more complex series of systems; however, at the heart of it, food is energy. The sooner we eat that produce once it’s harvested, the greater the amount of energy we retain from it. The longer our food is in transit, storage, and processing after its harvested, the more energy is lost. It’s no wonder fresh fruit and vegetables from a farmer’s market always looks, smells, and tastes so much more flavourful than the same tired looking fruit and vegetables near the end of a week at a grocery store (or perhaps in a fridge at home for too long). You know the kind I’m talking about. That said, there is nothing wrong with eating food that has been shipped in, it’s just that we’re not getting as much nutritional value from it. In some cases, it can’t be helped… there are certain things we simply can’t get where we are. At the same time, there is also so much variety locally to be explored and experimented with that it brings to question. Why not? 2. It’s more environmental. The transportation of import foods over long distances means high costs in energy and fuel for their transportation and storage. Eating more locally means a reduction in the need for those logistics and energy burn. So back to Fresh City Farms. Most of their produce is farmed in gardens right in the city and when necessary, in nearby farms. Only when the produce cannot be farmed here in Ontario does Fresh City Farms bring it in from the outside, and when they do, it’s clearly labeled. You can opt-out of certain produce, or add additional products to supplement your weekly food box. Food boxes come in small and large sizes that contain fruit or vegetable, or both, and can be delivered weekly or biweekly. When you order, you can also send the foodbox to a pick-up point, or if you have three or more deliveries to the same address, you can create your own pick-up location. Pick-up locations get a few dollars off each food box. It may take a little communication and follow-up to get your box set-up, as they’re still quite new, small, and ironing out wrinkles. But once it’s set up, it’s worth it. Our friends and we have been getting our food boxes like clockwork this season and it’s been great. If you haven’t yet, give them a try.